Fishing for: and more importantly; CATCHING BIG Flounder is by far one of my favorite types of angling due to what I term the “Recipe For Success”. 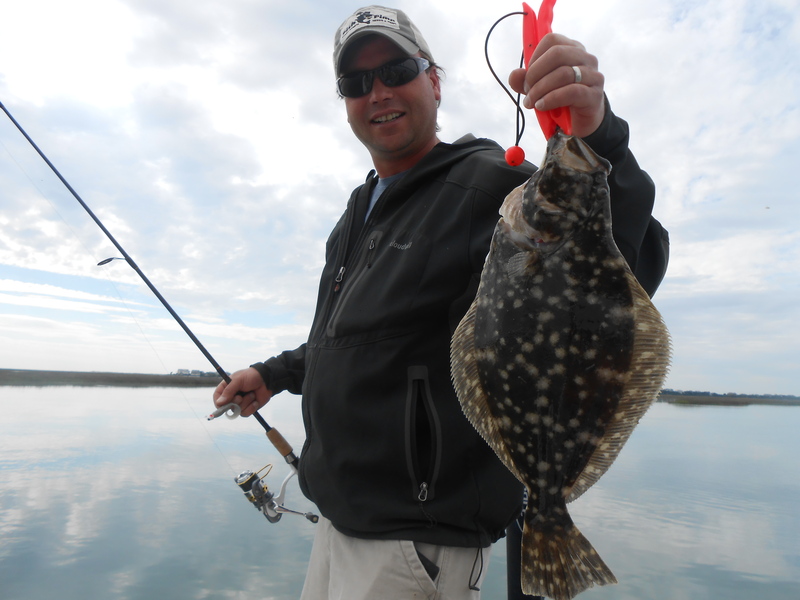 In successful Flounder Fishing, once you have obtained the knowledge (some call it “secrets” and speaking in terms of the What, Where, When, Why, How) combined with the on the water experience you can successfully target LARGE Flounder on a consistent basis. When Flounder Fishing, portion of the “Recipe” is Variable & the other is Consistent. 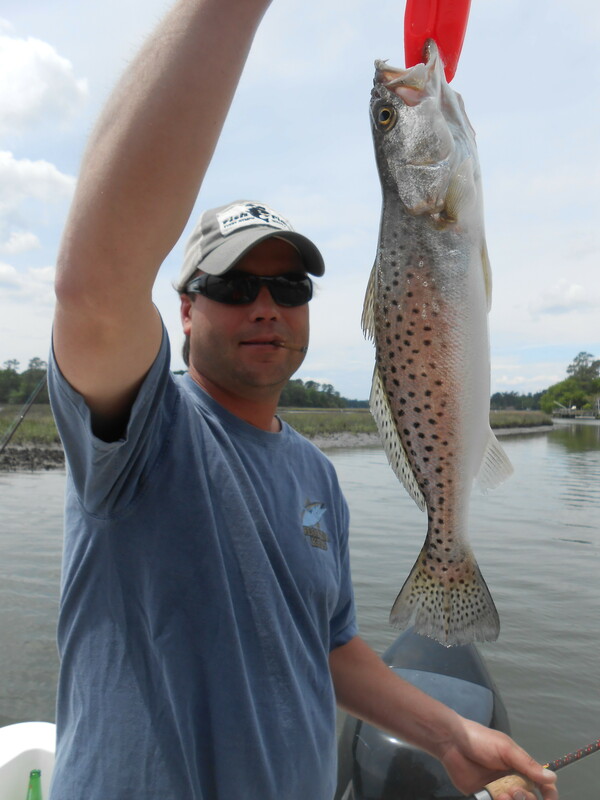 5/7/13 One of Many Nice Speckled Trout! When the Spring Water Temp Rises to around 63 degrees, the Flounder move into the Backwaters & Flats to Feed after the Spawn and GORGE on the baitfish & shrimp both in Fry and Juvenile stages. Mimic the Size, Color and Action of the Baitfish & Shrimp the Flounder are feeding on for the time of year (Stay in the Flounder Strike-Zone… bottom to 24 inches up the water column). This time of year I use the Smaller Artificial Presentation (3” baits now… whereas in the Heat of the Summer and into the Fall I bump up to 5 – 6” Baits) to produce that Reactionary Strike of the Big Flounder. Choose the Correct Color for the Season! In the Spring when using artificial baits, I use Grey and White Variations (Grey Pepper Flake, Pearl White, etc)… Reason, when the Water Temp are in the 60’s & 70’s the Baitfish have more of a lighter tent… as the water warm the baitfish and shrimp become brighter from Flashy Yellow, Silver to Copper. KNOW your Bait Color and Presentation for the Time of Year! 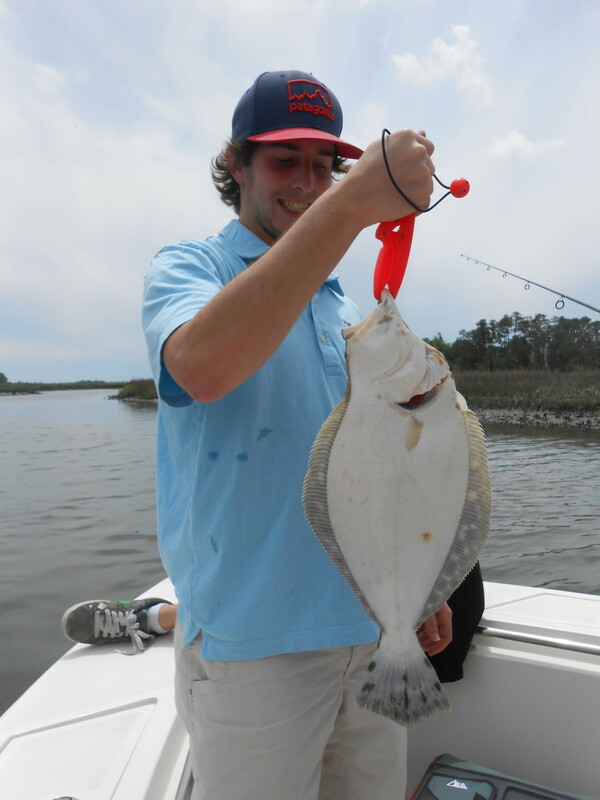 This entry was posted in Fishing Reports, ProFishNC News, Uncategorized and tagged Flounder Fishing Topsail Beach, Flounder Fishing Wrightsville Beach on May 9, 2013 by admin.